You made a huge investment when you bought your wired Bose QuietComfort 25 or QuietComfort 15 headphones. If you decide you want to make the jump to wireless, should you really have to spend another $300+? 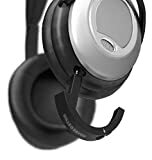 Check out the AirMod Wireless Bluetooth Adapter for Bose QuietComfort Headphones, which is available for both the Bose QuietComfort 25 and the QuietComfort 15 headphones. Just unplug your wire from the headphones and connect the AirMod adapter in its place. It looks OEM, and it adds great-sounding wireless audio in an instant.